AAAS is vying for the crown of Lord Vader or Chief Evildoer in its approach to suppressing open dissemination of scientific knowledge, even when that knowledge is paid for by tax payer money in the first place. They claim to support open access. They redefine it to be a pay for publishing charge (APC) of $3,000 USD and that restricts the subsequent use of the information in the article preventing commercial reuses such as publication on some educational blogs, incorporation into educational material, as well the use of this information by small to medium enterprises. If you really meant open access, the way the rest of world defines it, you’ll have to pay a surcharge of an additional $1,000. But it gets worse. A new faux open access journal Science Advances is being launched next year that will, get this, charge an additional US$1,500 above the fees listed previously to publish articles that are more than ten pages long. Wait…. this is a born digital publication with no paper distribution. They’re charging $1,500 plus the $4,000 to publish an open access article longer that 10 pages. It is bits, right? Their argument is that the freely provided peer review process is more difficult with longer papers so they should charge more for the effort, seeing as how they are getting their reviews for nothing anyway and this is just pure profit – and who doesn’t like pure profit? They claim that the additional ‘editorial services’ justify this additional surcharge. What about publishing your data along with your paper? Why would enough detail to replicate experiments be important since when we do we often don’t get the original results verified anyway…. 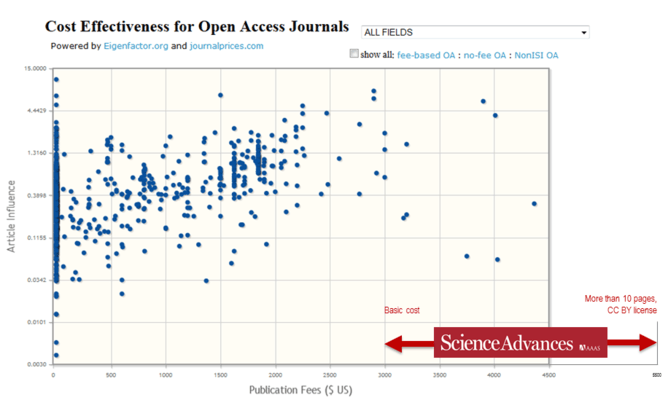 The AAAS commitment to open access is worth examining. Besides redefining it so that it isn’t open and accessible at all, they published a widely criticised study claiming the peer review process in open access journal is suspect. The criticisms were methodological. John Bohannon, a correspondent of Science, published the results of an experiment or sting operation in Science in an article entitled “Who’s Afraid of Peer Review?” to expose the problems of open access publishing. You can read the full text here – or you could if you have access to the journal Science which is behind a paywall. Those of you from university or colleges with a subscriptions to Science can gain access to it through your library, assuming they’ve been to afford to keep the online subscription. The rest, well, you’ll have to my word for it. The problem is it wasn’t study of open access journals at all. There was no population of other journal types to compare it to. He sent a bogus article to a group of open access journals, over 300 of them, from a list on the site the Directory of Open Access Journals. Fair enough. But none were send to proprietary journals and thus never explicitly compares open access model to the subscription model. What he’s pointing out, as the Martin Eve notes in the Conversation (a good article, btw) that Bohannon is highlighting problems with the peer review process. These are not new and they are a major concern. But they are not related to open access any more than they are related to subscription economic models. The bottom line is Science and the AAAS is trying to redefine open access to make it compatible with their highly lucrative current subscription model. They are levying APCs of $5,500 per article to “make a report openly accessible.” They’ve published a flawed ‘study’ to justify their actions and put up a website to support their mistaken claims (http://scicomm.scimagdev.org/). They have hired a managing editor for their new ‘open access’ publication Science Advances who is openly critical of the open access movement. They have lobbied the UN to try and pressure the Special Rapporteur in the field of cultural rights at the United Nations, Farina Shaheed who is preparing a report on open access for the UN Human Rights Council, calling open access young (aka immature), experimental (aka risky) unable to demonstrate the benefits that to them clearly exist from traditional reader pays (aka subscription based) publishing models. It’s time to recognise when a monopoly is trying to consolidate its position at the expense of the very people on whose work its prestige depends. Shame on AAAS. This entry was posted in open_scholarship and tagged APCs, open_access, open_science, scholarly_communication. Bookmark the permalink.